I wanted to know my life purpose as a child. I have been searching for divine answers all my life. I love transformation experiences and they occur on a consistent basis as I soul search for my creative and spiritual purpose on earth. I have had a deep faith, trust and belief in God before anyone taught me about the bible. The Spirit has shown me many times that God is in control and He is absolutely amazing. I believe in angels and that prayers change the world. I believe in sending loving energy to heal others. As an INFP—and sometimes an ENFP, depending on my mood—I like to spend time alone, thinking about life choices and living life to the fullest, making my time on earth an outreach of love and healing for myself and others. I have had interesting life experiences that continue to lead to paths of spiritual discovery and this path quenches and stimulates my soul. I have experienced healing and transformation through journaling, self-discovery books, praying and being open to wisdom each day. The Trinity (God, Jesus and the Holy Spirit) speak quietly in the universe through animals, nature, cards, people, circumstances, numbers, etc. There are so many clues when I choose to observe and listen. When I become willing and open to learning about my divine purpose on earth, there are answers in the universe. God isn’t always quiet when revealing the truth. 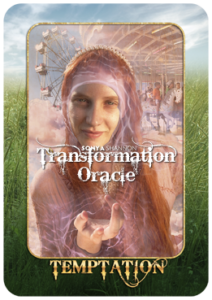 I love transformation experiences, they have taught me to trust and have faith in healing methods such as cards for guidance, gemstones, art, music, EFT, mudras, acupuncture, aromatherapy, color therapy, light therapy and sending out loving energy to others. Transformation opens the doors to new paths and opportunities for spiritual growth and direction. It is like going on an adventure that never ends. I am very thankful for everyone in my life and each life experience that occurs, whether bad or good it is necessary for my spiritual growth. 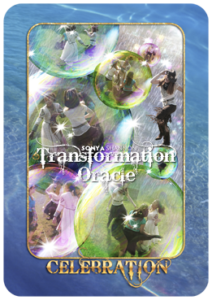 On the day of the Transformation Oracle Weekend Intensive Workshop, I recorded that the phase I was on was the RESURRECTION card. 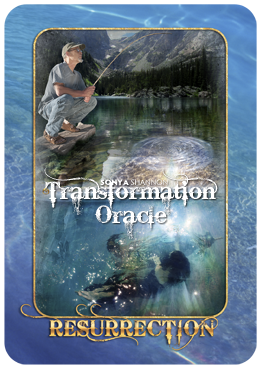 Taking the workshop was a resurrection of my passion, an awakening step for me, I felt the answers that I had been searching for finally appeared as I listened to Sonya teaching about the Transformation Oracle Cards. I could feel my life purpose coming alive with each spoken word, and with each assignment completed during the class I felt more clarity and direction. The most exciting news is that I was finally able to figure out why I was bombarded with the number 444 for the last seven months. I had researched the meaning of 444 extensively and nothing made any sense. Sonya said the time out loud when it was 4:44pm and a lady at my table stood up and started crying because her mother was born 4/4/44. Everything added up as a clear sign that stood out to me like seeing a rainbow in the sky. I am very happy that I do not have to wonder about the meaning of 444 …it is finished. 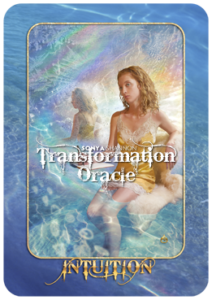 I received a confirmation in the CELEBRATION card, when I asked if I should work with the Transformation Oracle cards to help others and learn from each experience. I love this card, because I feel like celebrating and dancing for joy each time a person tells me the cards helped them and it was exactly what they needed or wanted to hear. The cards are like angel messages and people find it easier to accept and understand when they receive answers this way. I once asked my first and only psychic reader years ago if I should read cards for others and he pulled a Victory card. I have done free readings for homeless kids and it has been a blessing for them. I was told not to accept money for readings, so I did not charge for any readings. At the workshop someone told me to ask for a love offering and explain that it can be monetary, gemstone, drawing, flower, etc. and it is good to give and receive and that sounded very balanced to me. It became clear to me at the workshop that I could attend metaphysical fairs and do readings and turn this into a career that would be very healing and helpful to others. I have been searching for a part time business as I get older and the criteria had to be that I love doing it and that answer is an absolute YES. I believe in taking everything to God first, gratitude first and praying about everything. The PRAYER card speaks to me. I believe prayer can heal all our hurts and give us the solutions to life’s obstacles. Prayer is the most powerful and effective tool in our personal toolbox. INTUITION is the heart card, listening to the whispers that come from above, trusting God’s answers and having faith in all situations. I have learned that letting it flow works better than trying to push or shove your own agenda, knocking down doors doesn’t work, allow God to lead, listen carefully and take action when he opens the door. I sometimes say yes too often when I need to say no. I rush into things too quickly without testing the waters or asking enough questions. I understand that failing is okay (constantly learning) as long as I never quit and keep moving toward my life purpose. I am learning to say “no” without feeling guilty. To honor how I feel and move forward without feeling bad, letting go of what other people think and focusing on what I love and what has meaning and purpose for me. I get distracted easily so I want to overcome distraction and procrastination by setting clear short term goals, committing to what is important to me, setting up a routine and a sacred space so that I am able to finish projects and celebrate a new path in my life. I have been tempted in the past to enable or fix problems that are not my responsibility. Sometimes I care more than the person that has the problems. I have recently learned to let go and let that person face their natural consequences in hopes that they will become a seeker, someone who prays and cares enough to give and receive. Someone that will do their best and find their own path in life. I tend to have magical thinking where I want others to be magically successful and happy in their life, yet it takes hard work and many other success principles to get there. Many people may not want to put in the work that it takes to achieve that goal. Each person must search and seek their own answers. Tempted to be the caretaker and learning now to live, love and laugh more often. My goal right now is to live my life straight from the heart. To have spiritual strength to turn away from temptation and live according to the spirit. To forgive myself and do not judge others on my earth walk. 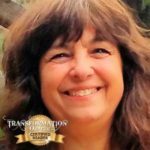 Learn how you can become a Certified Transformation Oracle Reader like Sandy Schneider!